In the early 1920s, Hans Reichenbach and Kurt Lewin presented two topological accounts of time that appear to be interrelated in more than one respect. Despite their different approaches, their underlying idea is that time order is derived from specific structural properties of the world. In both works, moreover, the notion of genidentity—i.e., identity through or over time—plays a crucial role. Although it is well known that Reichenbach borrowed this notion from Kurt Lewin, not much has been written about their relationship, nor about the way Lewin implemented this notion in his own work in order to ground his topology. This paper examines these two early versions of the topology of time, and follows the extent of Lewin’s influence on Reichenbach’s proposal. Research for this paper was variously supported by a Swiss Research Fellowship from the Canton of Ticino, as well as by a grant from the Swiss National Science Foundation (PA00P1–134177). 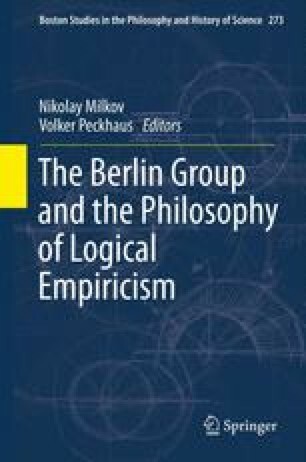 Early versions of this paper were presented at several conferences including the conference “The Berlin Group: Knowledge Probability, Interdisciplinarity” held in Paderborn in September 2009, and to the Visiting Fellows’ reading group at the Center for Philosophy of Science at the University of Pittsburgh in Spring 2009. On both occasions, I have greatly benefitted from the remarks made by the audience, especially the invaluable suggestions from Chris Pincock and Ulrich Krohs. I am also grateful to Sheila Sandapen, Joe McPeak, and Jacques Catudal for comments on a more recent draft of this paper. Finally, I wish to thank both the Directors of the Archives of Scientific Philosophy in Pittsburgh and Konstanz, and of the Wiener Kreis Stichting in Amsterdam for their permission to quote from the Hans Reichenbach and the Moritz Schlick Collections. My special thanks goes to Brigitte Parakenings from the Konstanz Archives for her help in supplying unpublished material.